Pascale displays are some of the highest quality trade show displays available. Exceptional engineering technics are used to create display systems that are innovative, modern, and appealing while remaining extremely portable. Pascale exhibits are some of the easier hybrid displays to set taking as little as 30 minutes! 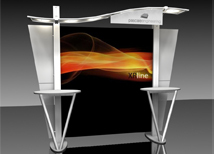 Exhibitline and XR styles are available to offer different price points and design qualities! 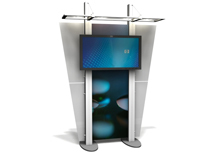 Exhibitline 10 and 20 foot displays offer affordable price points and very high quality construction specifications. 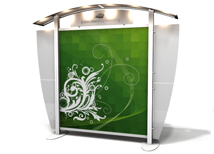 Canopies with built in lights, backwall graphics, and shipping cases are included! XR Line displays offer a modern design including flat and wave canopies making this display system stand out from the crowd! All of our kits include printed backwall graphics, built in lighting, and shipping cases! The XV line is the newest addition to the Pascale line up. European styling makes the XV line perfect for companies looking for a modern look. Kits can be customized with optional counters and other accessories! Pascale designs multiple kiosks, workstations, and counters that are practical and portable. There are options available for nearly any trade show need, while custom designs are available for more specific designs! All Pascale displays are manufacturer and engineered by Pascale Engineering in the United States. These displays are almost 100% US made and each unit is hand built to unsure the highest quality and construction. Lead times are only 5 days making these displays great for anyone in a time crunch. There are two design styles available including the XR and Exhibitline. 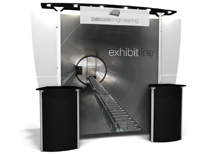 The Exhibitline is a more traditional display that is more affordable but also very attractive and versatile. Exhibitline has canopies with built in lights creating an even lighting system that is hidden to maintain aesthetic appeal. The XR series is more modern as is ideal for companies targeting young audiences that are drawn to modern designs. All of our Pascale display systems include shipping cases and graphics so the price you see is the final price you pay out the door(plus shipping). Pascale displays work great with any of our portable trade show flooring options that are available in multiple colors and finishes!